Ray Brillinger and Cy Hack spent a couple of years educating themselves about community foundations before they established their fund at HCF in 2014. Ray is a retired human resources manager and organizational change consultant. Cy spent his career in administrative, hospitality, and retail work. Both currently do volunteer work in the community. 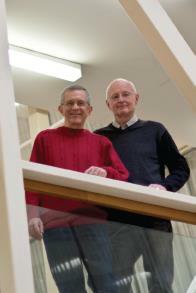 A couple since 1982, Cy and Ray have been active supporters of key gay and lesbian groups for decades. While they have seen great progress during their lifetimes in the rights and protections for the LGBTQ community, they are well aware that the fight for dignity and equality is not over. They plan to continue supporting that sector through their fund, along with other areas that interest them – including international development charities, the arts and education opportunities for disadvantaged youth. The community foundation model felt like a great fit for them, not only as part of their estate planning but also for their current philanthropy. They like the flexibility the community foundation offers to build their fund over time, vary the groups they support, and grant to any eligible Canadian charitable organization. “As we don’t have children,” adds Ray, “the fund is an important part of our estate planning.” He feels that the relationship he and Cy develop with Foundation staff over the coming years will help guide the granting decisions the Foundation makes when they are gone. While their fund agreement lays out their areas of interest, “there may be a need in the community that the staff see and say ‘that’s something Ray and Cy would have liked to support,’” he says.